@tran2 do you have a particular modification in mind? Hi. I'm getting this error now. [Pires Nogueira] I'm using Ushahidi V2 and I'm having some problems with mamecha. [Pires Nogueira] I'm having this problem now. [Pires Nogueira] Hi. I have the memcache installed and running but Still having the error. [David Losada, Ushahidi] is it listening on that port 11211 ? [David Losada, Ushahidi] mm yea that’s the php module adaptor.. but is the service running? [David Losada, Ushahidi] like if you run ps -e | grep memcache is there a process? [Pires Nogueira] Is it possible use the Ushahidi on the cloud? Can I rung without memcache? [Pires Nogueira] I opened the file, now where I change? [David Losada, Ushahidi] no problem, good luck! [Pires Nogueira] What is the next step? 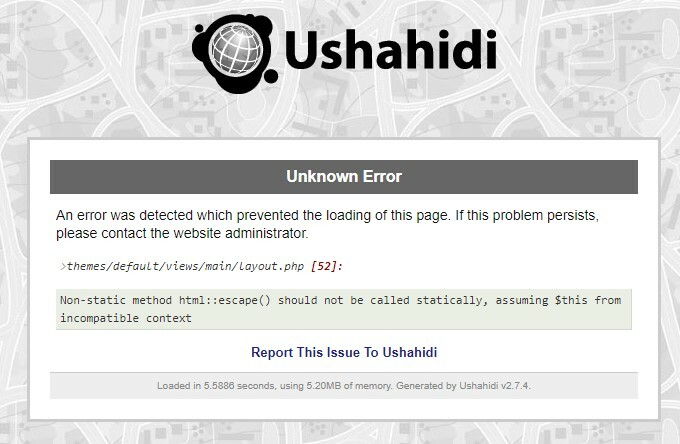 [David Losada, Ushahidi] Are you still getting errors?